If you've heard Einherjer's full-length debut, try to remember the songs "Dreamstorm" and "Forever Empire," and imagine what expanding upon those musical ideas would sound like as a full-length compact disc. If not, try to imagine what the "Viking" metal style would sound like without the tone-deaf "clean" baritone singing about hair-shirts and dragon's breath. Now turn the keyboards down or off, relegate the "clean" vocals to sporadic appearances on the last few songs, and teach the "clean" vocalist to properly sing. There; that's a good comparison for the uninitiated. If that still makes no sense, or you've never even heard of "Viking" metal, that's ok. It's a stupid term anyway, and I don't see any of these "Viking" people raiding French or English shores. So, try to imagine black metal with thrash and death influences, rhythms grounded heavily in Norwegian traditional music, and snarling vocals. 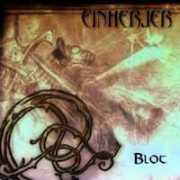 The songs are of average length, midway between the verse/chorus/verse structure of traditional metal, and the flowing, epic style ofnumerous black metal bands; in fact, Einherjer's song structure strikes an almost perfect balance between those extremes. Is there a trend of metal bands returning to their eighties roots? It's starting to sound that way. One listen of a song like "Wolf-Age" makes my intended point obvious: Eighties thrash solos and melody have both returned to black metal, and Blot is peppered with a handful of them. "Wolf-Age" is the most obvious example, sounding disturbingly like Savatage, but the eighties influence is everywhere. This isn't necessarily bad; tempering Einherjer's characteristic sound with a concentration on catchy rhythms keep the band far above the cesspool of lousy "Viking" metal acts that’s overflowed on the genre's bathroom floor. In fact, it only improves on the concepts that Einherjer used for their last CD. This album's defects are few, but I can't let them slide. First, like so many other modern metal bands, Einherjer intersperse their songs with melodic passages; and, like so many other modern metal bands, they often sound completely out of place, to the point where I think "what the hell just happened here? Did they get bored?" There aren't many melodic sections, and most of the songs make do without, but that only makes the contrast more glaring when it surfaces. Also, Einherjer's strong Norwegian folk influence gives some songs a really annoying "sing-song" feel, especially during those melodic breaks - about how I’d imagine the Swedish Chef sounding, on a black metal CD. Thankfully, there are no clean vocals singing "bork bork bork." If you really want those, look for Thyrfing's latest. Ah, yes, metal clichés: There are a couple, but you’ll be straining to find them, so they don't detract from anything. Keyboards, for example, are generally minimalist, or else relegated to providing atmosphere- but Einherjer have always used those, and they're a lot less prevalent than on their last two CDs. Also, a singing chorus makes an appearance during Ingen Grid, but they're so unusually talented that it fits inperfectly. Overall, though, this one's sound is heavier, occasional acoustic introduction notwithstanding. What more is there to say? Einherjer have always had a unique sense of musicianship, and here they present it in a refined and developed form. The balance of playing styles and influences broaden this album’s appeal, while their songs are interesting enough that one can replay the album without getting bored. It’s not so melodic as to annoy a seasoned listener, but there’s enough atmosphere to set a proud and near-Medevial tone. I'd call this their greatest effort yet, and I'd recommend the disc to anyone. The Bottom Line: An excellent, mature effort from Einherjer, showing an impressive range of influences. In the end, it's Viking metal with snarling vocals, but it's so exceptionally well performed that even genre newcomers should have a listen.